“Dividend House” is a person nearing retirement age who decided to take the bull by the horns, divest her and her husband’s portfolios of mutual funds and start investing in dividend growth stocks (DGI). In order to make sense of her portfolio she devised a wonderful analogy of the stocks in her portfolio as being sections of a house, i.e. foundation, walls, roof, etc. If you’re so inclined you can read about her Dividend House model here: https://seekingalpha.com/article/3791466-build-dividend-house-stocks-go. Recently, Dividend House, posted another article discussing the possible need to replace one of the stocks in the foundation portion of her portfolio. The stock she was considering replacing was Owens & Minor (OMI). OMI is a healthcare company with an excellent record of growing dividends. However, in recent years, the turmoil in the healthcare industry has wreaked havoc on its business model and forced it to adapt or die. For this reason Dividend House was considering removing it as a foundational stock. Stocks that form the foundation of a portfolio should very rarely need to be sold. Dividend growth must have exceeded and have a reasonable expectation for continuing to exceed the annual rate of inflation. My rationale was simple as well. The overall goal of the portfolio is to provide a safe and growing stream of income in retirement. She also want to sleep well at night (SWAN). A dividend king stock has proven to be resilient in all kinds of markets and economic conditions. As long as you can reasonably expect its business model to continue to be successful and its growth to exceed the rate of inflation nothing else should really matter. I would also have fewer stocks in my foundation. Foundational stocks should be big, ‘cornerstone’ size investments. I would have more, smaller positions in my wall stocks and even more and smaller positions in my roof stocks. After writing these comments, I decided I would spend some time coming up with what I thought would be a good foundation for a DGI portfolio. However, before doing that I had to come up with a methodology for how I would build my own dividend house. First, the foundation. I previously referenced my simple criteria for selecting foundational stocks. I also decided that foundational stocks would constitute 50% of my total stock portfolio and that each position would be less than 5% of the total stock portfolio. Thus, my foundation would consist of no more than 10 stocks. Next, are the walls. The criteria for wall stocks is similar to those of the foundation. The only difference being that the stock must be a Dividend Aristocrat, having increased its dividend annually for at least 25 years. The walls would constitute 25% of my overall portfolio. The criteria for stocks in the roof of my dividend house would consist of equities that have raised their dividends annually for at least 10 years. In aggregate, they would constitute no more than 15% of my DGI portfolio. Finally, I would also have a garden section of my dividend house. This would consist of ‘up and comers’ in the world of DGI stocks. They might not have any record of annual dividend increases but have the potential for rapid revenue growth and eventually might become consistent dividend growers as well. The garden would constitute no more than 10% of my total DGI portfolio. After building this framework I then spent some time determining what stocks should be placed in the foundation of my dividend house. Using David Fish’s latest DGI spreadsheet which you can find here: http://www.dripinvesting.org/tools/tools.asp, I found that there are currently 27 companies that qualify as Dividend Kings, i.e. having raised their dividend annually for 50+ years. 10-year yield on cost (YoC), assuming investor had purchased stock 10 years ago at the 52-wk low. 5-year YoC, assuming investor had purchased stock 5 years ago at the 52-wk low. Free cash flow (FCF) payout ratio using the most recently available data. In most cases this was the fiscal year 2017 data, but in some cases was the trailing 12 months, and in a couple of cases was the 2016 fiscal year data. 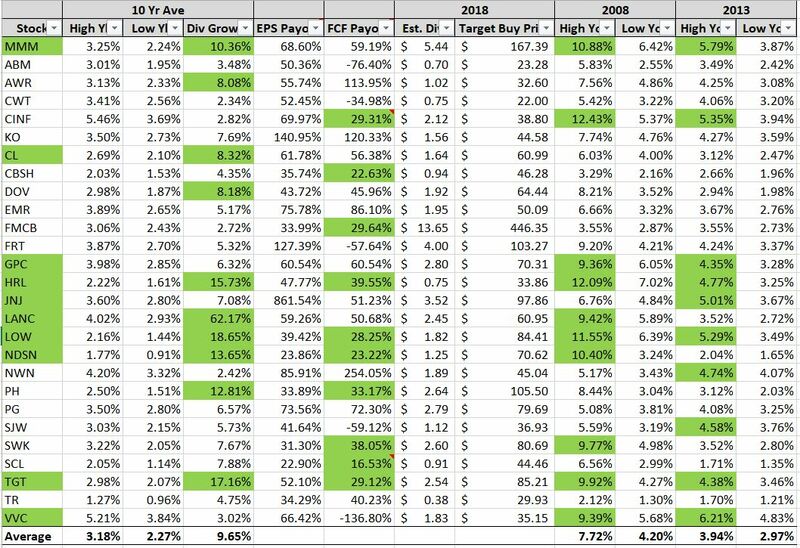 8 of 10 were in the top 10 of the 10-year highest yield on cost, 7 of 10 stocks selected were in the top 10 of the 5-year highest yield on cost, 4 of 10 were in the top 10 of the FCF payout ratio, and 3 of 10 were in the top 10 of all four criteria. The results of my analysis are contained in the below table. Minnesota, Mining & Manufacturing (MMM), now more commonly known as 3M, is a large cap conglomerate which has increased its dividend annually for 60 years. I selected MMM because of its enviable ability, despite its size, to grow its dividend at a double digit rate. It also has a very high 10-year YoC. Colgate Palmolive (CL) is a well-known manufacturer of personal care products. It too, is a large cap stock. It has increased its dividend every year for the past 54 years. I selected it because of its high single digit growth rate in dividends as well as its leading position in a recession resistant industry. People are never going to stop buying shampoo and toothpaste. Genuine Parts Co. (GPC) is a lesser known but well respected manufacturer and retailer of replacement auto parts. It has increased its dividend annually for 61 years. GPC is one of those companies that you rarely see mentioned on CNBC or on the lips of your friends as a stock tip at a cocktail party. I selected it because it too is in a recession resistant industry and despite not being in the top 10 of 10-year average dividend increases, its annual dividend increases have handily outpaced inflation. It also was in the top 10 for both 10-year and 5-year high YoC. Hormel Foods (HRL) is a well-known name in the food manufacturing industry. It has raised its dividend for 52 years. I selected it for its recession resistant business model and the fact that it was in the top 10 of all four of my selection criteria. Johnson & Johnson (JNJ) is one of the most well-known and respected companies on the planet. It is a large cap stock that is diversified across the healthcare and pharmaceutical industries. It has raised its dividend annually for 55 years. I selected it for its consistent growth. In my opinion, no DGI portfolio would be complete without it. Lancaster Colony (LANC) is an amazing hidden gem. Like HRL, it operates in the food manufacturing industry. It has zero debt and has raised its dividend for 55 years. I selected LANC for its conservative balance sheet and its focus on returning capital to its shareholders. Not only does this company pay out a growing annual dividend, it also pays out a special dividend every few years. The past couple of times the special dividend alone has equaled 5%! Lowe’s (LOW) is the well-known home improvement retailer. This large cap stock has also increased its dividend for 55 years. I selected it because it was one of only three stocks that were in the top 10 of all my criteria. Nordson Corp. (NDSN) is another one of those hidden gems I found. Prior to doing this research I had never before heard of it. It is a manufacturer of packaging machinery. It has increased its dividend every year for 54 years. Despite it having a very low initial yield, it has one of the highest 10-year YoC. Target (TGT), like JNJ and LOW, is another one of those household name stocks. It operates as a big box retailer. It has increased its dividend for 50 years. I selected it because despite its well published hiccups of the past several years (data security and amazon competition) it has managed to continue to rapidly grow its dividend. It was also one of the 3 stocks which were in the top 10 of all of my criteria. Vectren (VVC) is a lesser known utility stock. It operates both regulated gas and electric utilities in the Midwest. It has increased its dividend annually for an amazing 58 years. I selected it as the one utility in my foundational portfolio and also because of its conservative, slow growth, operations. Before wrapping up this post I want to briefly comment on two prominent Dividend Kings that are conspicuously missing from my pick of foundational stocks. They are Coca Cola (KO) and Procter & Gamble (PG). Both of these companies, while continuing their streak of annual dividend increases, 55 and 61 years respectively, have faltered in the past several years. Neither company was in the top 10 of any of my selection criteria. I own KO in my current portfolio and as a result of this analysis I am considering replacing it.